Saddleback against Grossmont on Friday. EL CAJON (2-10-2019) – Grossmont College opened the 2019 women’s fastpitch home schedule on emotional highs and lows, splitting a doubleheader with powerful Los Angeles Valley College of Van Nuys. 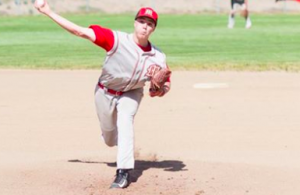 The Griffins opened the season with a 15-7 loss at Saddleback on Friday before the home opening twinbill the next day. Both contests were blowouts, as the visiting Monarchs (23-13 in 2018) took an easy 11-3 run-rule decision, but the Griffins bounced back to post an even more-decisive 15-1 run-rule pasting. The Game Two triumph was especially important since Grossmont (12-27-1 in ’18) was coming off its poorest season this century, yet romped over an opponent which pushed state-power College of the Canyons for the Western State Conference crown last spring. 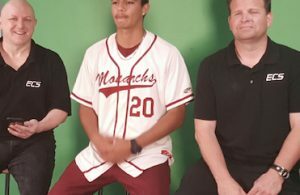 L.A. Valley 11, Grossmont 3: The Monarchs had already played five games while Grossmont sat through several rainouts, so it as no surprise when they jumped quickly with five run in the 1st and 3rd innings to mount a quick 11-0 lead. Hanna Moulton ran her pitching record to 5-1 in spinning a 6-hitter, with all three runs allowed were unearned. 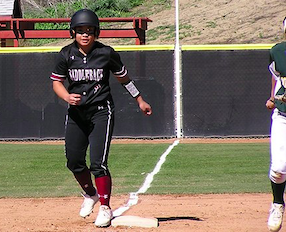 Griffins designated player Veronica Quirino, a freshman out of Morse, batted 2-for-4 with a run scored. 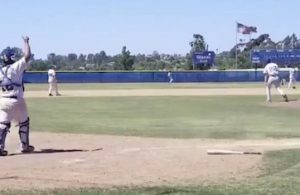 Grossmont 15, L.A Valley 1: Think the Monarchs had a nice start with five runs in the 1st in Game One? Forget it after the Griffins doubled that effort with a 10-run explosion in their initial trip to the plate, then added five more markers in the 2nd to return the blowout favor. After first baseman Gabby Clippinger (West Hills) singled home center fielder Alizah Jameson (Mater Dei Catholic) to open the scoring, Griffins shortstop Ashley Nelson belted a 2-run double for a 3-0 advantage. 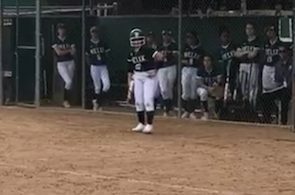 The freshman from Helix batted 3-for-3 with 4 RBI, plus a walk, a stolen base and a run scored. The top of the Grossmont batting order — Jameson, left fielder Sierra Marty(Ramona) and Clippinger — each scored three times. Quirino, the clean-up batter took advantage, going 2-for-4 with 2 RBI; she was also walked twice to finish the day reaching base six times in 10 trips to the plate. Quirino also gained the pitching win, carrying a shutout into the final inning before L.A. Valley center fielder Elizabeth Flores homered to center with one out. The Griffins (1-2) cap the homestand on Tuesday (Jan. 12), entertaining Santiago Canyon at 3 p.m. before participating in the Mt. San Jacinto Tournament next weekend.